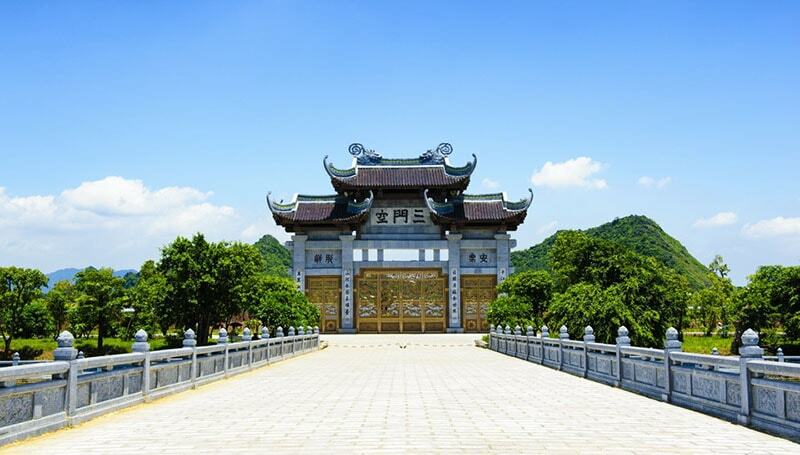 Bai Dinh Pagoda – Bai Dinh Spiritual and Cultural Complex is a complex of Buddhist pagoda on Bai Dinh Mountain in Gia Vien District, Ninh Binh Province. The compound consists of the original old pagoda and a newly created larger pagodas. It is considered the largest complex of Buddhism pagoda in Vietnam and has become a popular site for Buddhist pilgrimages from across Vietnam. 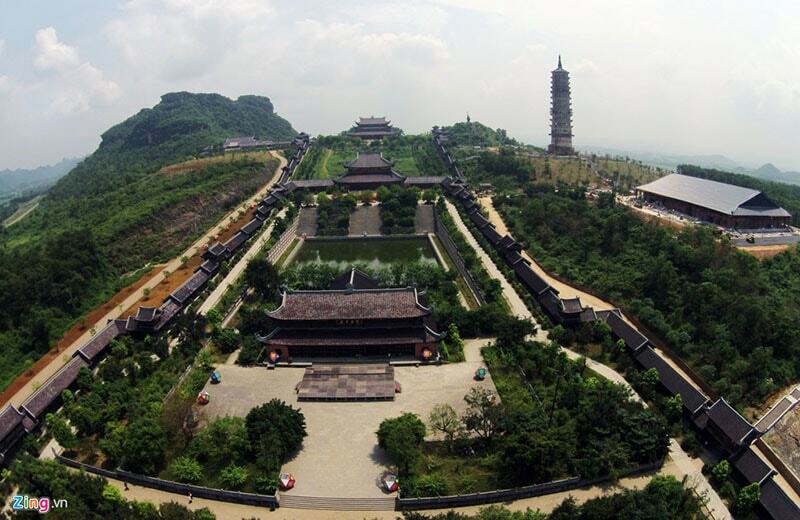 The new pagoda of Bai Dinh encompasses an area of 700 hectares, a large complex which includes many structures built over several phases starting in 2003 and finally completed in 2010. The pagoda’s architecture follows traditional lines, consisting of large halls, courtyards and enclosures, but the huge scale of Bai Dinh makes it strikingly different from previously built Vietnamese Buddhist pagodas. The largest structure, the Tam Thế Hall, rises to 34 m at its roof ridge and measuring over 59 m in length. 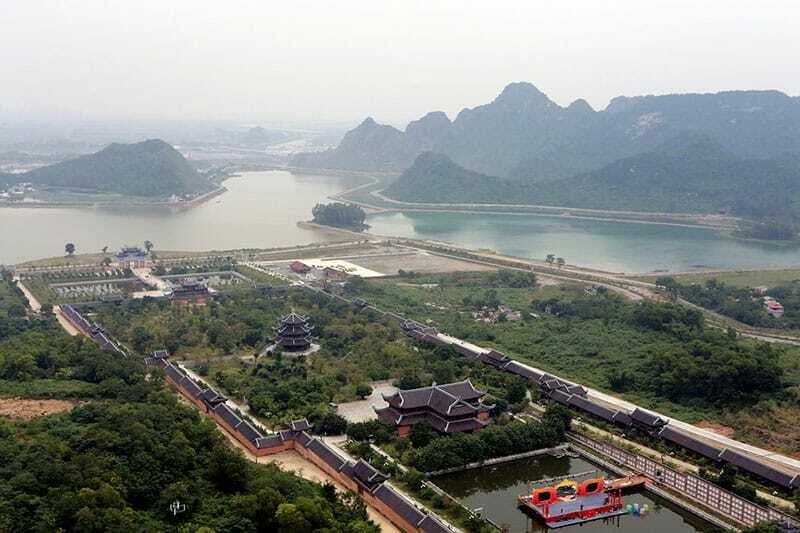 The construction materials are locally quarried stone and timber from Ninh Binh, tiles from Bat Trang… although reinforced concrete was also employed for the scale of construction. Despite this, the temple adheres to traditional Vietnamese designs with its curve finials and corner eaves soaring outward and upward, likened to the phoenix’s tail. 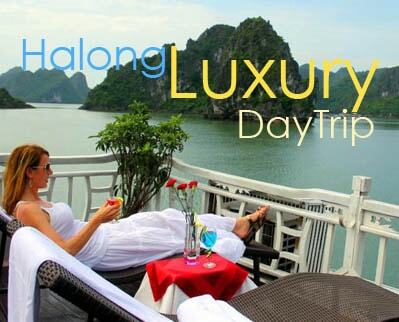 Interior decorations were selected specifically for artisanal works from the local handicraft villages, among which are the bronze workers of Y Yen, stone carvers of Ninh Van, wood carpentry of Phu Loc, embroidery from Ninh Hai. 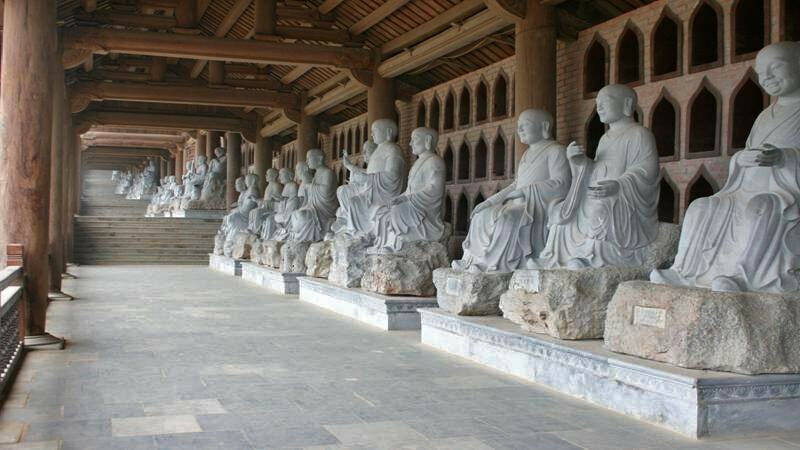 The pagoda also sets record for having the greatest number of Arhat Statues in ASEAN. 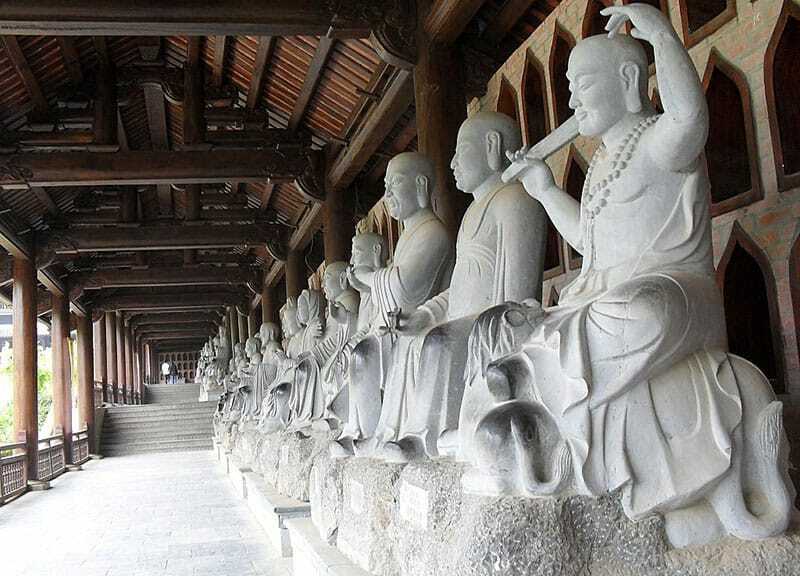 All of its 500 Arhat statues are made of stone and taller than men commonly are. 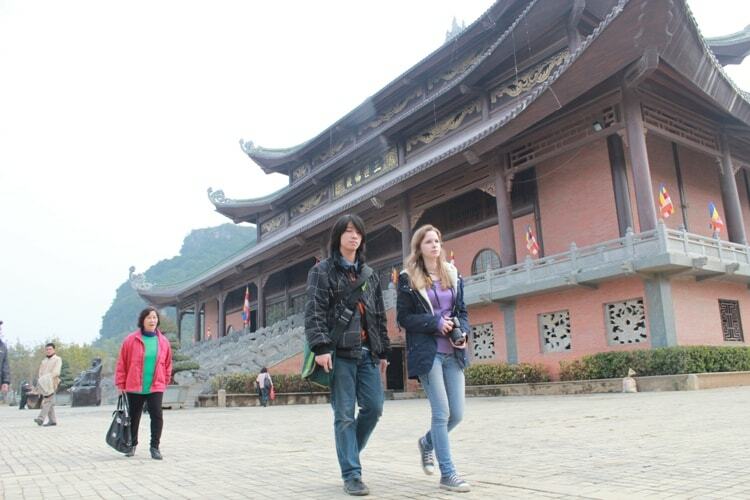 The original Bai Dinh pagoda is located in the foothills some 800 meters from the new pagoda. Ascending a series of over 300 stone steps, the path passes under an ornamental gate to reach the entry. The temple itself is located in a series of small caves on the mountainside. 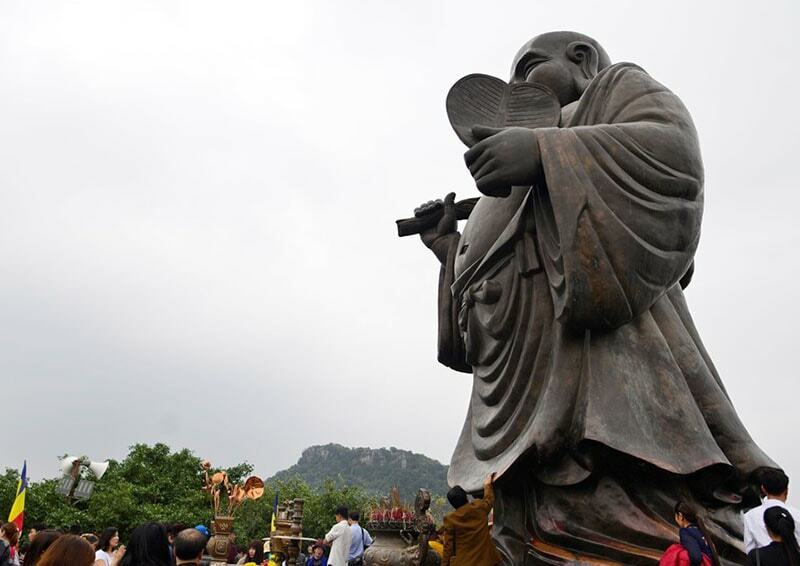 Along with Buddhist deities, natural spirits of the mountains are also venerated. The back of the old pagoda, which is a part of Trang An Scenic Landscape Complex, leans against the Bai Dinh Mountain with the height of 200m. Bai Dinh pagoda hosts a large festival on the sixth day of the first lunar month drawing huge crowds. Buddhist rites are performed in the New Pagoda in conjunction with traditional rituals from the Old pagoda.